Month-to-month swings can appear large because of the small sample size of the population survey, ZipRecruiter’s labor economist Julia Pollak told CNBC. “The Current Population Survey is a survey of about 60,000 households, and the sample sizes get small when one slices the data by age group and employment status. But the overall trends appear positive,” Pollak said. Although the number can be volatile, several industries including government and educational services where the employment distribution skews toward older workers have seen “sluggish” growth lately, Pollak pointed out. 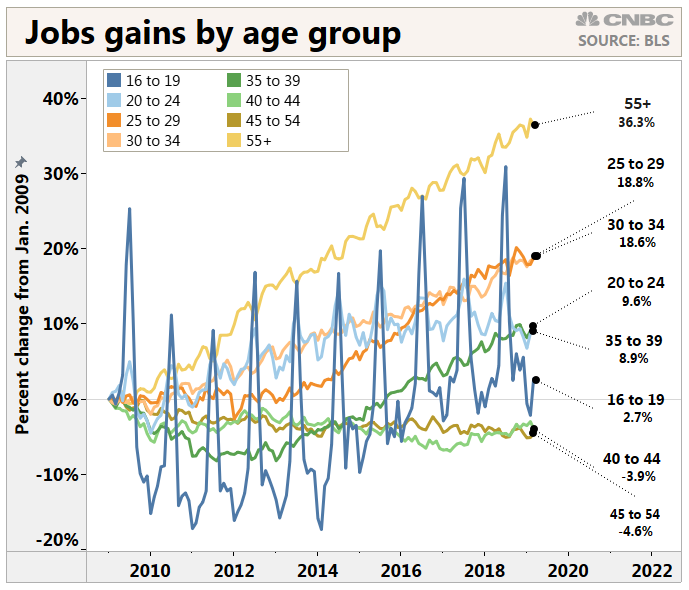 Baby boomers have been the biggest job gainers in the last decade. Many of them facing retirement tend to stay in the workforce partly because they fear they don’t have enough money saved up. President Donald Trump has also pushed for policies to encourage more Americans to get back to work as baby boomers retire. “The broader trend is that the participation in 55 and over continue to rise,” Dismuke said. “I do think there’s an issue that people haven’t saved enough and they are forced to work longer. We have a smaller percentage of our jobs today [that] are manually taxing like they would’ve been 40 years ago,” and less physically demanding work allows people to work longer, Dismuke said.